This is part of the Hollywood Bowl’s ‘Classical Tuesdays 2’ concert series and Angel, will be playing the ‘Concierto de la Amistad’ that world-renowned pianist, conductor and composer Lalo Schifrin, wrote. Jack Price, founder of Price Rubin & Partners and concert pianist formerly known as Dickran Atamian, is proud to announce his artists, guitarist Angel Romero and conductor/composer Lalo Schifrin, who wrote the score to “Mission Impossible,” will be headlining at the Hollywood Bowl during its Tango Under the Stars with Dudamel concert, which will feature the world premiere of Schifrin’s “Concierto de la Amistad.” The concert takes place on Tuesday, August 2, at 8 p.m.
“This is part of the Hollywood Bowl’s ‘Classical Tuesdays 2’ concert series and Angel, arguably the greatest guitarist of all time, will be playing the ‘Concierto de la Amistad’ that world-renowned pianist, conductor and composer Lalo Schifrin, who also has six Oscar nominations and five Grammy wins, wrote,” said Price. 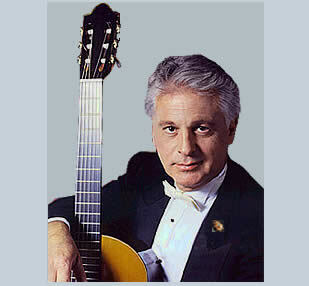 Angel Romero, the Spanish maestro of the guitar, is a revered soloist and conductor and one of the most sought-after musicians of his generation. He has appeared in some of the top venues in the world including those in London, Paris, Berlin, Vienna, Madrid, Munich, Zurich, Chicago, Los Angeles and New York. Lalo Schifrin, a true Renaissance man, is equally at home conducting a symphony orchestra, performing at international jazz festivals, scoring ‘Mission Impossible,’ or creating works for the Los Angeles Chamber Orchestra, the London Philharmonic and even the Sultan of Oman. To purchase tickets for Tango Under the Stars with Dudamel, please visit http://www.ticketmaster.com/event/0B005089E287546F?brand=hollywoodbowl. On August 4, another Price Rubin artist, Lu Ye, who was recently knighted in Canada as Lady Lu Ye, is scheduled to perform at the 2016 Olympics opening concert at Santuario de Cristo in Rio de Janeiro. “For the first time in history, the only gala concert ever to be held at the extraordinary Santuario de Cristo will take place, and will feature our soprano Lu Ye,” said Price.